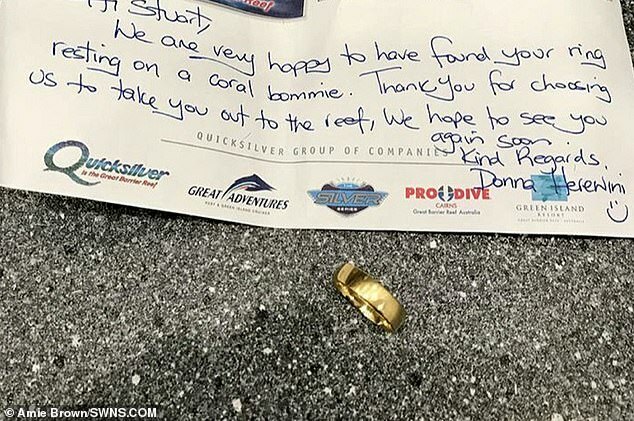 A newlywed who lost his £700 gold wedding ring snorkeling in the Great Barrier Reef was left stunned after discovering it was found by a scuba diver more than two weeks later. 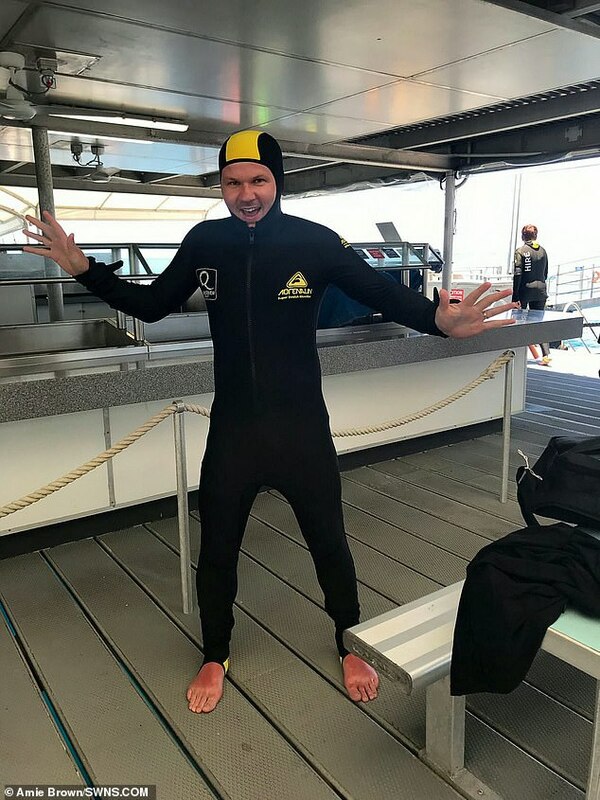 Stuart Brown and wife Amie jetted off to Australia on their honeymoon after tying the knot and signed up to snorkel at the Agincourt reef in Port Douglas, Queensland. But 29-year-old Stuart, from East Kilbride, South Lanarkshire was left devastated when his £700 gold band slipped off his finger just minutes after he entered the water. The honeymoon of a lifetime quickly turned into a disaster when Mr Brown, a project coordinator, searched for the treasured trinket but it could not be found. Mrs Brown, 27, said: ‘When the ring came off Mr Brown’s finger and he told me I didn’t believe him at first because he is a bit of a joker. ‘And because the water over there is crystal clear he actually saw the ring going under but a fish swam past and he couldn’t see it anymore. ‘I was absolutely devastated, I knew it could be replaced but it wouldn’t be the original ring. We mentioned to the tour company that we had lost the ring but that was only for insurance purposes. 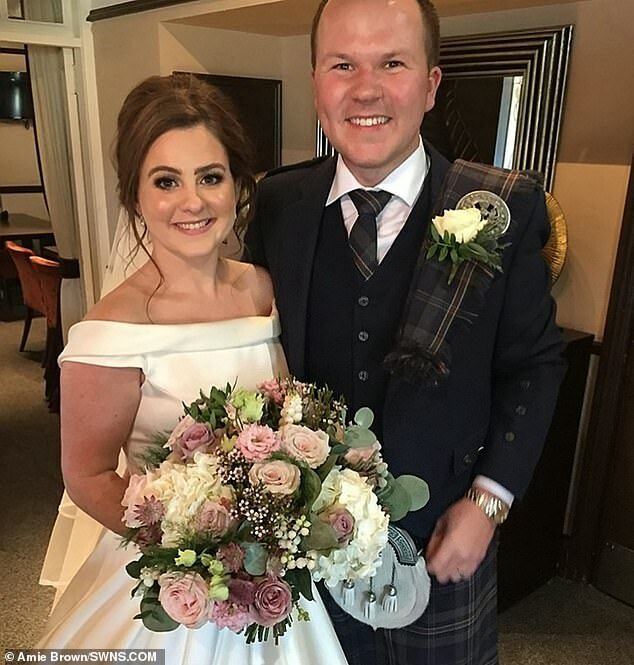 The couple, who were married at Lochside in New Cumnock, Ayrshire, on October, 6 flew out to Dubai and then Oz before returning from their honeymoon on October 31. On November 15 the couple received an email from the cruise company Quicksilver saying the ring it had turned up on coral where they were swimming – 18 days later. Quicksilver Cruises posted the treasured ring back to the couple who were delighted to be reunited with it. Mrs Brown, who works as a solicitor, added: ‘We had an amazing honeymoon. It was sad to see that Mr Brown had a tan line from where the ring was before he lost it. ‘But when we got the email saying they had found it, we were in absolute disbelief. And although the ring has been returned to Mr Brown’s finger, he now does not want to go and get it polished. Mrs Brown said: ‘It’s a bit scratched now but he does not want to go and get it polished. He thinks the scratches have a good story to tell.